This is a light dish full of sweet and sour flavor. Both the chicken and the sauce can be prepared in advance and reheated before serving. Place the raisins in a small bowl, pour the cognac over the raisins and let stand for a while. In a small saucepan heat the oil, add the onion and sauté over low to medium heat, covered, stirring from time to time until the onion is soft. Add the raisins, lemon rind, lemon juice and broth. Bring to a boil and cook, uncovered, until the sauce is reduced a bit, about 5 minutes. Season to taste with salt and pepper. Dry the chicken with a paper towel. Spread the flour on a sheet of wax paper. Heat the oil in a skillet with a cover. Dredge the chicken lightly in flour, shaking off the excess. Sauté the chicken over medium heat, turning once with tongs until the outside is just seared. Season lightly with salt and pepper on both sides. Pour the sauce over the chicken, bring to a boil, reduce the heat to low and cook covered for 4 minutes. Turn the chicken over and cook for another 3 minutes. The chicken should be pale pink on the inside. Season with lemon juice, salt and pepper and cover until serving. 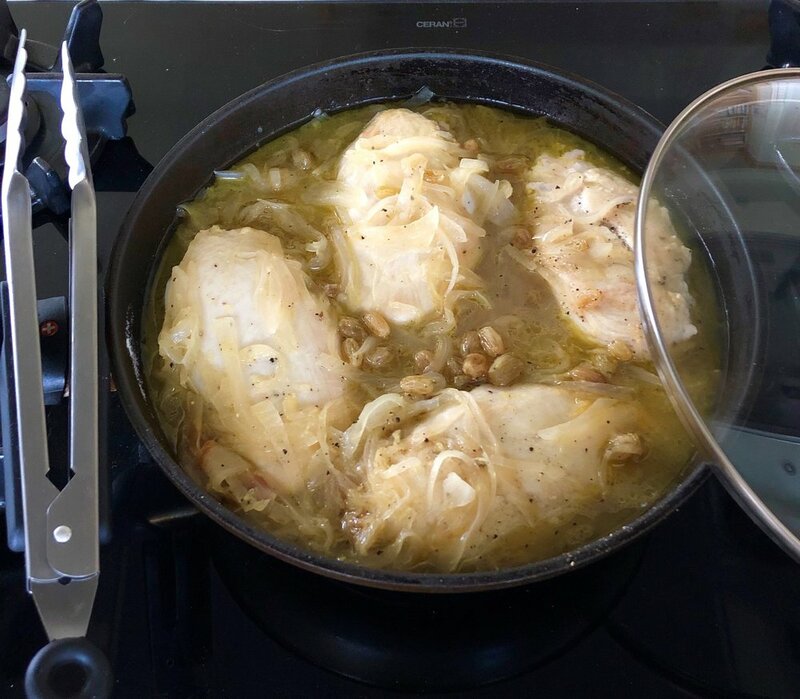 If you wish to prepare this dish in advance, you can cook the sauce, sauté the chicken and pour the COOLED SAUCE over the chicken, (if hot, the sauce will cook the meat) and proceed to finish cooking.